Havana, Cuba is a coveted Caribbean destination, which recently became possible to visit for many Americans. All thanks to the lessening of travel restrictions in the last three years. This enthralling city features a rich Latin American culture still captured in the former glory of the last century. Disclaimer: This post contains affiliate links which we could earn a commission from if any purchases are made. Havana, Cuba, is the capital of the largest island in the Caribbean. In its glory days, this former Spanish territory bared all the Spaniard’s architectural and economic prowess. Something that is still visible in the old, run down but charmingly beautiful buildings found in this city. Havana, which has remained largely unchanged in the last 50 years due to US trade embargos, has seen a recent upsurge in visits from American citizens. Cruise ships dock at the eastern edge of the island at the Sierra Maestra cruise terminal. A natural harbor in the Atlantic Ocean. From the cruise pier, you will go through customs and a money exchange bureau to convert your dollars into CUC money, which is the preferred mode of payment in the island. Opposite the cruise terminal lays one of the town’s four main Plazas known as Plaza de San Francisco. The plaza is well known for its fountain of lions. Observe Havana’s rich heritage from the plaza. Or stop by for a refreshing cold drink at the Hotel Palacio del Marqués and enjoy the stunning views of the palatial surroundings. One of the most iconic Cuban attractions is the 1950’s American Classic Cars that are ubiquitous in the city. These cars have been maintained, revamped and polished in bright neon colors. They are a huge tourist attraction and a bucket list item for most. These classic cars are not only fun to see but even more, fun to ride in. You’ll need your Travel Sunscreen for that sunny day going around in an iconic Cuban car! So, hail one and take a ride through town and past Havana’s landmarks for a truly incredible experience. They charge about CUC 30 an hour. Experience what it felt like to ride in a classic Buick, Ford, Chevrolet or Oldsmobile back in the mid-’50s. A tour of Old Havana or La Habana Vieja as popularly known in Cuba is one of the highlights of visiting Cuba. This is a town stopped in time and not a town like any other. Old Havana which was founded in 1519, was made a UNESCO World Heritage Center in 1982. It features a baroque of neoclassical buildings that are evidence of the nation’s past wealth from its Spanish colonial days. The brightly painted palatial homes, government buildings, and narrow cobblestoned streets are interesting to explore. Make sure you’ve got a Cruise Travel Pouch for all your cards and money. Though some are run down, efforts are underway to restore them to their former glory. You can tour the town on foot from the cruise pier; take a taxi or a rickshaw. However, it’s better to do it by foot, taking in all the rich details; while appreciating the neighborly feel in this densely populated Caribbean town. Smack in the middle of Old Havana is Plaza de Armas, the oldest plaza in Havana. This 16th-century plaza was used by the military for its parades and military purposes. It’s now a charming tourist center where books are sold on the streets and it becomes a moonlit Romantic Square by the evening. It’s definitely worth checking out in both times of the day. There are benches around and a nearby park. You will love chatting with locals, people watching or perusing through the book market. Plaza de la Catedral is one of the newer plazas in Old Havana. It was built in the 1720s and draws its name from the Cathedral of Havana built on it. The Cathedral is one of the stateliest American Baroque churches in the world. Following its construction, it became the location of some of the grandest mansions in Havana. Today you can find the Colonial Art Museum and a number of restaurants in the square. Immerse yourself in Cuban history at Revolution Square. Known to be one of the largest plazas in the world where political rallies and even masses are held with millions of people in attendance. This plaza features most of Cuba’s landmarks starting with the 358ft tall tower dedicated to Jose san Marti memorial. A Smaller statue of him seats 59ft tall at the base. Opposite this dominating star-shaped tower are the government buildings of ministries of interior and communications which bear large steel faces of Cuba’s most iconic heroes Che Guevara and Camilo Cienfuegos. Most of the nation’s government buildings and cultural institutions are located here. Adults and kids will love appreciating art in the working neighborhood of the Jaimanitas. Fusterlandia is a neighborhood that has been covered with a tile-based mosaic fantasy artwork on all of its walls. Fusterlandia is a miniature version of Gaudi’s public works in Barcelona. The talented artist José Fuster used his neighborhood walls as his canvas and the results are enchanting. So much so, that he has inspired artists out of his neighbors as well. You can shop for art from Fuster and other artists in this creative world. Explore the intriguing social history of Cuba at the Hotel Nacional De Cuba. Almost every famous person to visit Havana has stayed in this hotel which was built in 1930. The hotel was constructed on Taganana hill in the Vedado district along the Malecon. Among the most popular people to stay at the hotel include Frank Sinatra, Ernest Hemmingway, Winston Churchill, and many other entertainers and high society individuals. Hotel Nacional has an intriguing history of mob associations and even hosted the famous Havana Conference that was depicted in the Godfather II movie. A part of the hotel was turned into a history museum with photos of every famous person to have visited the place posted on the walls. This part of the hotel is called Vista al Golfo Bar, a nice place to grab a coffee or a meal, while you explore. You can also tour the extensive underground tunnels that were used during the Cuba Missile Crisis. 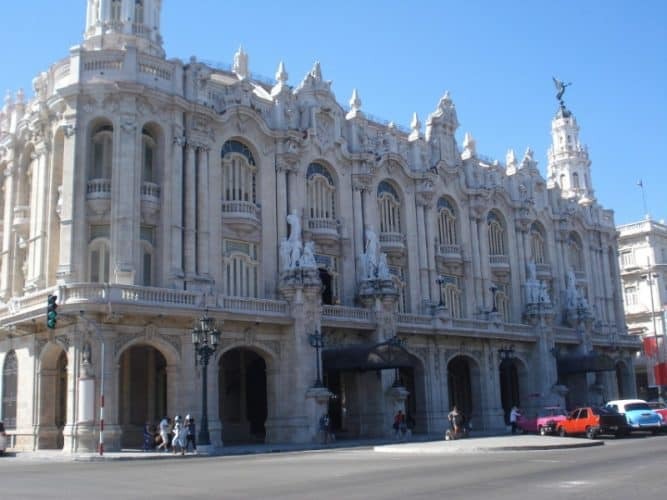 Visit the Great Theatre of Havana otherwise known as Gran Teatro de la Havana. The theater hosts the National Ballet of Cuba and is popular for its ballet shows. It also hosts the National Opera. The popular concert hall was even used by President Obama to give a speech on his tour of Cuba. With all that walking around, exploring and learning interesting things about Cuba, you are bound to get thirsty. As such, pop into El Floridita, one of the most famous bars in town. This bar is said to have remained in the same venue since it was opened in 1817. It’s also known to be one of the main influencers of the Daiquiri movement. However, it’s more famous because of Ernest Hemmingway, who was a patron at the bar during his residency in Cuba. People come from far and wide to take a photo with the statue of him erected at one corner of the counter. One of the bar’s most popular daiquiri drink is Hemmingway’s favorite known as the papa doble. Ernest Hemmingway’s fans also have a treat while in Havana. They can visit his home the Finca Vigia in the suburb of San Francisco de Paula. The house is located 15miles away from downtown Havana. You can take a bus or taxi to the place. Finca Vigia is now a museum which remains as the famous writer left it. Go for a visit and explore the ways that Ernest lived while he wrote much of the For Whom the Bell Tolls and the popular The Old Man and the Sea books. Take a walk on the Malecón and chat-up a local. The Malecon is a spectacular attraction that is five miles long on Havana’s coast. This seaside promenade runs from old Havana, cuts through Central Havana and ends in Vedado district. It was built in the 1900s and is a good place to chat with a local, drive by or simply sit and enjoy Cuban music played there. 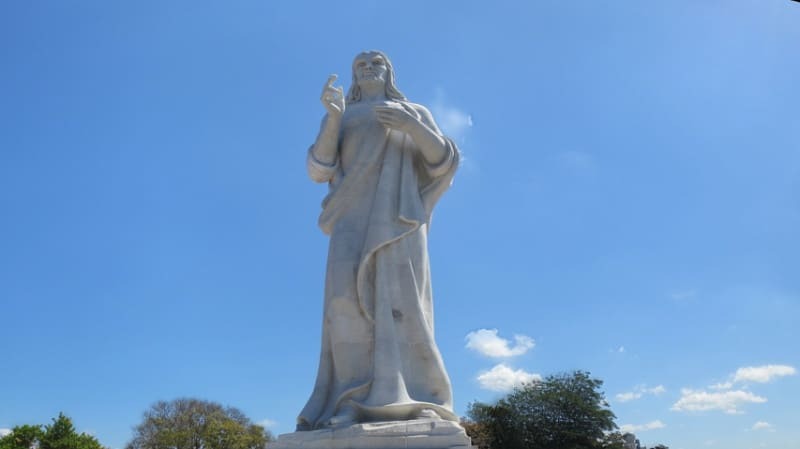 For panoramic views of the city, you can hike up to the statue of Cristo de La Habana otherwise known as Christ of Havana. The statue stands 66ft tall in the suburb of Casablanca. It was skillfully created with 67 pieces of Carrara marble by Cuban sculptor Jilma Madera. The statue which sits at least 167ft above sea level is elevated up to 259ft making it quite visible from many parts of the town. You can take a cheap ferry service from the cruise pier to the statue. The shopping scene in Cuba is a bit underdeveloped but all the same, there are pretty interesting gifts you can buy. They include the likes of paintings, Cuban cigar, rum, coins, number plates, straw hats, music, and, woodwork. Almacenes San Jose is the largest craft market in town. It is housed in a warehouse along the Malecon at Desamparados. It is, however, way too touristy. Check all these Cuban Souvenirs from Amazon. If you are looking for authentic shopping then try the pedestrianized street of Calle Obispo in Old Havana. This narrow cobblestoned street has plenty of interesting shops and restaurants to pop into. Don’t buy Cuban Cigars and rum from the streets. Visit the official shops known as La Casa del Habano. Street cigars are mostly fake and stuffed with paper. Havana, Cuba has so many museums thanks to the island’s culture of reverently remembering and celebrating their history, traditions, and heroes. However, with limited time in port, you will only want to visit those that are truly significant to learning the history of the nation. One such museum is the Revolution Museum which depicts the struggles that Cuba underwent to come out of a dictatorship. Art is very well appreciated in Cuba and you will appreciate it too at the Museum of fine arts. Where art from the 16th century is shown as it progressively develops over the centuries. Another great museum is the Museum of the City. This museum shows the history of the colonial period and Cuba’s struggle for independence. Cuban cuisine is a rich flavorful mix of different traditions. The flavor is influenced by authentic Cuban ingredients coupled with a touch of West African recipes, and Caribbean traditions. Pop into any one of the Paladares (privately owned home-based restaurants) for a real taste of Havana, Cuba. Some of the most popular items on the menu include Ropa Vieja a pulled pork and braised beef dish, grilled lobster, Arroz con pollo (chicken and rice), Moros y Cristianos (black bean and rice), Empanadas, and Dulce de leche (a caramelized sweet milk for dessert). Music is a popular lifestyle in Havana, Cuba. Wafts of music can be heard in the air once you are on port. As you walk along you will meet plenty of bands, some with old men playing Cuban traditional music. Engage with the musicians to learn a thing or two about Cuban music. A popular place to listen to old school Cuban music is at the Buena Vista Social Club, where you can grab dinner while old Cuban musicians entertain you to popular Rhumba music. 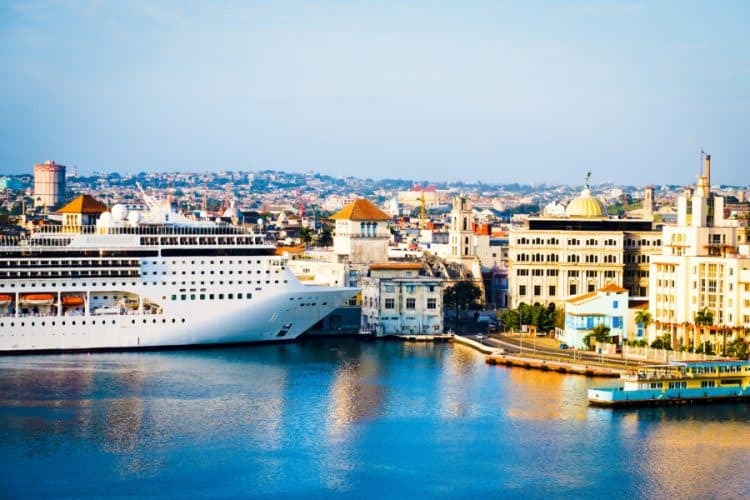 One of the first sights to behold as you approach Cuba from your cruise ship is the huge fortress erected at the Havana harbor. To quell rapid harbor attacks experienced in the 15th century, the Spaniards built a huge fortress at the entrance of the Havana harbor. The El Morro fortress protected the island and is a popular site for cruise visitors. Its besiegement in 1762 led to the creation of an even larger fort on the eastern side of the harbor’s entrance known as La Cabana. These well-preserved forts are now a historical park and feature plenty of museums. 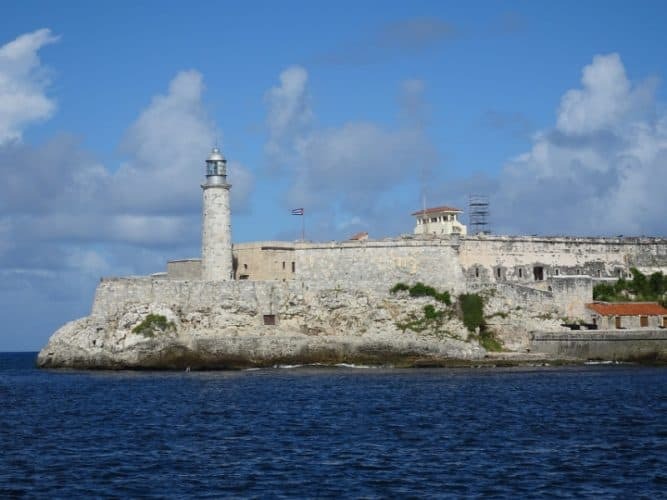 Visit the forts and learn interesting Cuban history. If staying overnight, go experience El Cañonazo de las 9, the customary firing of the guns every night to signal the closing of the gates. It’s a tradition that has taken place since the colonial days. 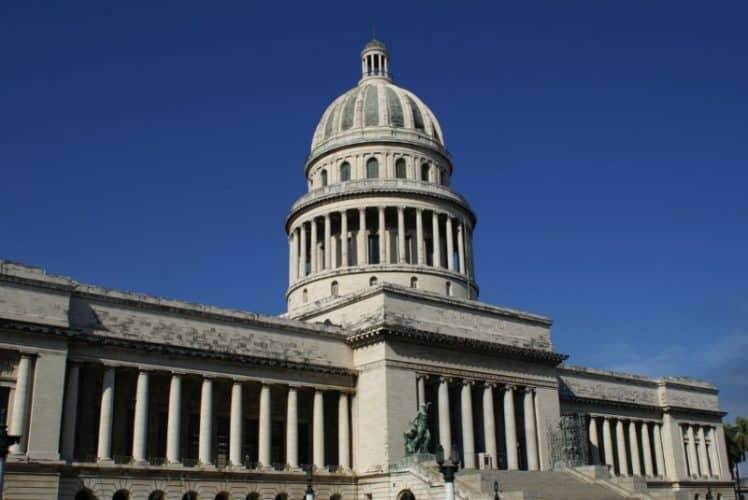 Take up a tour of El Capitolio, Cuba’s National Capitol Building in Havana which resembles US’s capitol building. It’s not just enough to admire this stately building from the outside. A tour of the inside reveals majestic décor and upholstery depicting excellent craftsmanship. It’s open every day except Sunday and Monday from 10 AM to 4 PM and a tour is charged CUC10 per person. Done exploring the beautiful town of Havana? How about a trip to the heart of Cuba’s jungle? Where you will experience Cuba’s village life? This is an excellent day trip to explore nature, indulge in traditional Cuban cuisine, tour the plantations and even get a chance to swim in the rivers. 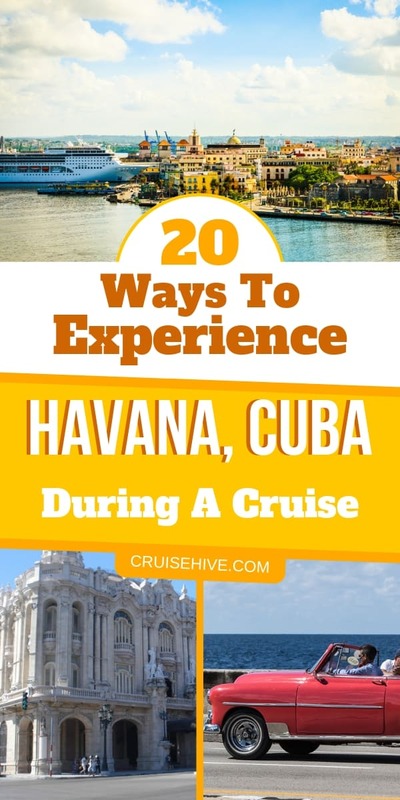 Mostly offered as a cruise ship excursion, this is another excellent way to experience Havana, Cuba. Now that you know all the adventures and curious mysteries that await you in Havana, Cuba, I bet you are eager to visit the island. If so, remember to plan adequately and if you are from the US, ensure you understand the legalities of a trip to Cuba. Cuba just like other Caribbean islands experiences tropical island weather and is hot and humid throughout the year. The most preferred season to visit is from December to April. That’s it from us here; enjoy your trip to Havana, Cuba. Happy Cruising! !